Fresh for the Fall of 2015, SIDI brings us the Fast Rain and the Deep Rain boots, fresh off the Italian presses. For the adventurous among us, soggy socks and wet feet are no fun on long-haul excursions. You take your waterproofing seriously, but Gore-Tex is just too mainstream nowadays. Luckily SIDI heard your cries and released the Jekyll and Hyde of waterproof boots, the short commute Fast Rain and the beefy adventure Deep Rain. The SIDI Fast Rain Boots use Technomicro in place of leather in its main construction. Yup, you heard right - no leather here. Vegans, rejoice! 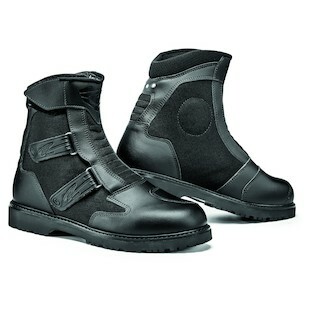 Cordura is also present for accent panels, which are complemented by SIDI’s High Security Velcro closure system. I can only assume the Velcro used to work security for the POTUS, and is thus mega-legit. Internal heel, ankle, and toe protection will keep your feet from suffering at the hands of this generation’s road warriors, while a full length gaiter will keep all 10 toes dry as a bone (unless you have Hyperhidrosis). Look it up. Double stitching in all high stress areas will give you a second level of protection, as will reflective points above the rear heel. And just incase you’ve been called “an accident waiting to happen,” the non-slip lug type sole will keep you sure-footed for years. For those of us not content to ride back and forth from work to home, there’s the SIDI Deep Rain Boots. SIDI combines their most popular off-road and touring features into a boot that has just as much bark as it does bite. Taking its styling cues from the Adventure Rain and GTX boots, the Deep is no stranger to badassery. The Technomicro exterior shields a waterproof / breathable membrane and a Trockenfuss liner for quick sweat evaporation. Replaceable buckles will keep your toesies in place so the rigid, shock resistant and anatomically shaped heel-cup can do it’s job. With the same non-slip lug type sole as it’s little brother, the SIDI Deep Rain will keep your head above water in all but the deepest of puddles. 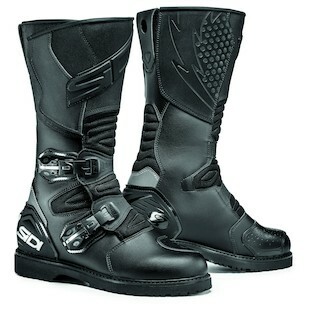 SIDI has hit what looks to be a homerun with their new Fast and Deep boots. Stylish, high quality, and functional boots can be hard to come by - but luckily, your favorite Italian boot manufacturer has come through in the clutch.